The commission sought to use collaborative participatory design processes to develop a long-term vision and masterplan to develop a Centre for Woodland Innovation in the historic Ecclesall Woods in Sheffield. Collaborating with landscape architects, sustainable business and community regeneration consultants the process involved engaging creatively with a wide variety of stakeholders, including resident craftspeople, neighbouring communities and woodland users. Following a series of workshops and discussing ideas over the course of a year, an extensive feasibility study with design proposals was presented to Sheffield City Council. This proposed short and long term master-plans, landscape proposals, sustainable business models, a “design language’ and environmental systems design. The project addresses the future of a sustainable timber industry for South Yorkshire. A key aim was to promote the innovative use of timber and to further the understanding of woodland in South Yorkshire and their importance globally. Projecting 1, 3, 5, 10 and 20 years forward the report addresses both the future for working tenants and production at the site and the facilities for visitors to the site. The existing buildings on site range from shipping containers, to single skin brick buildings. One of the main considerations was to assess whether the building stock was fit for purpose and future use. We looked creatively to find appropriate uses of structures where possible. As part of the masterplan we created design proposals for a woodland visitor centre, somewhere that could be inspirational for a wide series of events. This idea was taken forward by the council’s architects who incorporated many of our design ideas and some of their own including outdoor terrace. The building which opened in 2011 is well used and really successful. Landscape elements formed a major part of the design proposals. There was an opportunity to introduce new planting which is not constrained, by the need to conserve and duplicate the flora of the adjacent ancient woodland. 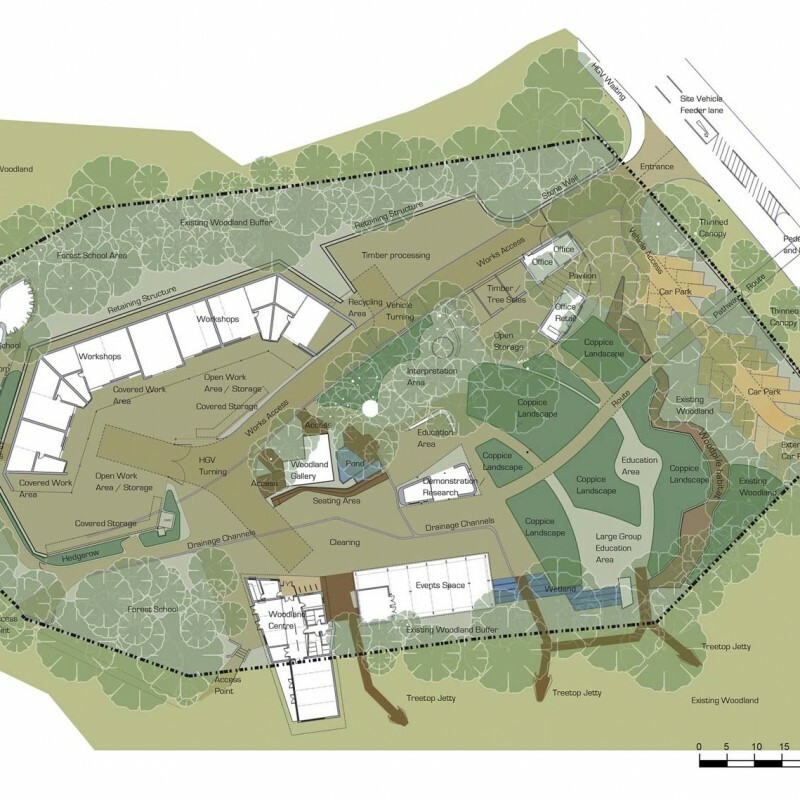 The proposed planting aims to enhance the woodland experience and the educational value of the site. Management strategies which include coppicing and pollarding can help to reveal the story of how Ecclesall woods evolved. New planting will also play an important role in providing materials for educational groups and producing bio fuel, for the heating system. The planting has also been arranged to work with existing planting in order to frame views and create areas of spatial enclosure.